New HD rubber belting all round. New 120 ltr FW. tank & pump. New flybridge, with second steering & controls with space for 6 persons. New s/s code-hight handrails all round. Large void space under wheelhouse, approx 6ft long x beam. New fwd twin-berth cabin & cabin top. New wheelhouse, galley & separate deck entrance heads. Twin-helm with full engine controls in both wheelhouse and flybridge. Raymarine C120 Radar and Chart Plotter. Pioneer radio & CD player. All new nav lights, horn, spotlights etc. New s/s manifold for bilge, deckwash from new Jabsco 1.5" eng. driven pump & Whale 1.5" hand pump. New Rule 1.5" bilge pump & alarm in engine room. Much improved over the original, this vessel was a 1989 hull by Lochin Marine Ltd, Newhaven which has just completed a full custom rebuild. She was a very successful ex-creel boat, purchased and stripped to a bare hull and then rebuilt to workboat code spec. - all work overseen by an approved surveyor with recent survey report available. She is a full rebuild completed in May 2016 with new wheelhouse, flybridge and new fore & side-decks. A rebuilt aft deck with new flush hatches over-engine and two large storage lockers. Deck approx 20ft long x full beam of vessel. 4 x water-tight compartments. This vessel is in excellent condition throughout. Now in full commission, ready to code with recent survey available. 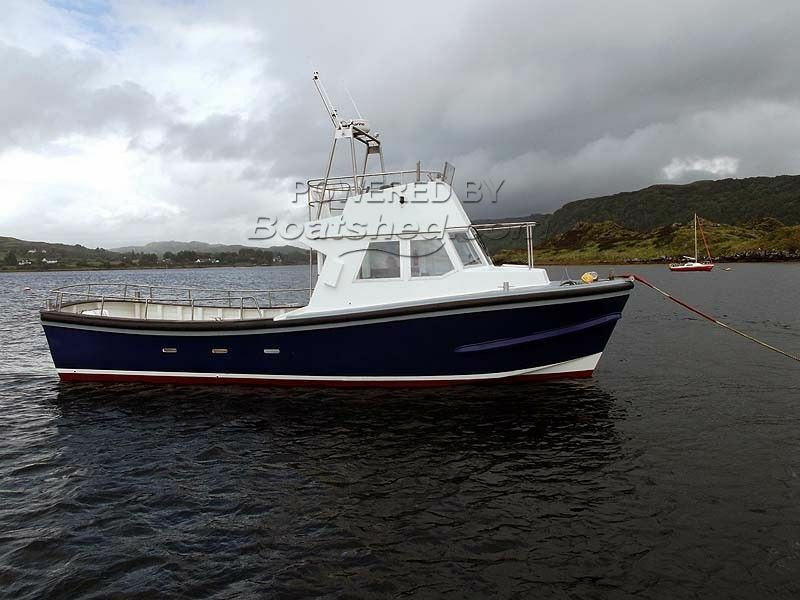 As well as pleasure, she would be very suitable for wildlife/ whale watching, angling, diving or survey and standby type work. This Lochin 38 Complete Re-build 2016 has been personally photographed and viewed by Ian Sawkins of Boatshed Scotland. Click here for contact details.